Toni grew up on the east side of Indianapolis, attended Warren Central High School and has lived on the south side of the city with her family (husband John and their four kids) for more than 20 years. She graduated from IUPUI in 1996 with a bachelor’s degree in accounting and finance, with a minor in economics. Toni began her career as a staff accountant at UAC and then American Trans Air. She took 12 years off to start a family and raise her kids. She decided to re-enter the workforce part-time for a break from all the responsibilities of being a mom, adding that compared to wrangling four children, returning to the world of finance and accounting was a breeze! 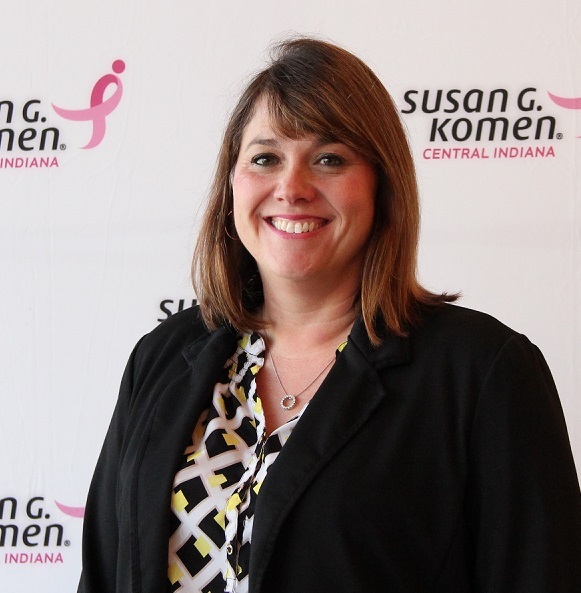 Toni joined the Komen Central Indiana team in October 2012 and as such, she is our senior-most staff member. Toni oversees all aspects of money and finance for our Affiliate, from handling donations and matching gifts to managing our accounting software and bank reconciliation entries. She also helps with customer service needs for anyone who calls or stops by the office, manages internal needs with our headquarters office in Dallas and serves as a resource for the newer staff members. Toni’s busy times are tied to our biggest fundraising events, including Race for the Cure and Pink Tie Ball. She has helped with the planning and execution of five Races, in addition to helping when the Central Indiana affiliate joined forces with the Wabash Valley Komen office. Toni and her family have a nine-year-old German shorthaired pointer and enjoy traveling when they can. Her family vacations have included several tropical cruises and a trip to Hawaii, along with an upcoming trip to Punta Cana in February. She said warm weather and beaches are a must-have when it comes to traveling – no snowy mountains for her! Much of Toni’s life is centered around sports and other school and extracurricular activities. Her kids range in age from 17 – 10. The two oldest sons play high school football and their team won the 2016 4A state championship game at Lucas Oil Stadium. She coached soccer for her daughter’s team in the 11 and 12-year-old age bracket and enjoys many additional mom duties. If you could stay one age forever, which would you choose? My young 30s because my kids were young. What is your personal philosophy? Carpe Diem because you only live once.